This classic text by Fei Xiaotong, China's finest social scientist, was first published in 1947 and is Fei's chief theoretical statement about the distinctive characteristics of Chinese society. 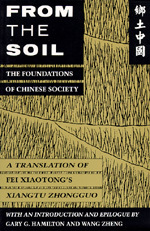 Written in Chinese from a Chinese point of view for a Chinese audience, From the Soil describes the contrasting organizational principles of Chinese and Western societies, thereby conveying the essential features of both. Fei shows how these unique features reflect and are reflected in the moral and ethical characters of people in these societies. This profound, challenging book is both succinct and accessible. In its first complete English-language edition, it is likely to have a wide impact on Western social theorists. Gary G. Hamilton and Wang Zheng's translation captures Fei's jargonless, straightforward style of writing. Their introduction describes Fei's education and career as a sociologist, the fate of his writings on and off the Mainland, and the sociological significance of his analysis. The translators' epilogue highlights the social reforms for China that Fei drew from his analysis and advocated in a companion text written in the same period. Gary G. Hamilton is Professor of Sociology at the University of Washington. Wang Zheng is a Ph.D. candidate in the Department of History at the University of California, Davis.